Do you want to feel safer in your smart home? Are you looking for a decent and reliable security camera? The devices available on the market are all different and have their own features, so choosing the right one is not always easy. There are some factors to consider before making your choice. Everything is getting smarter and the same goes for the security cameras. 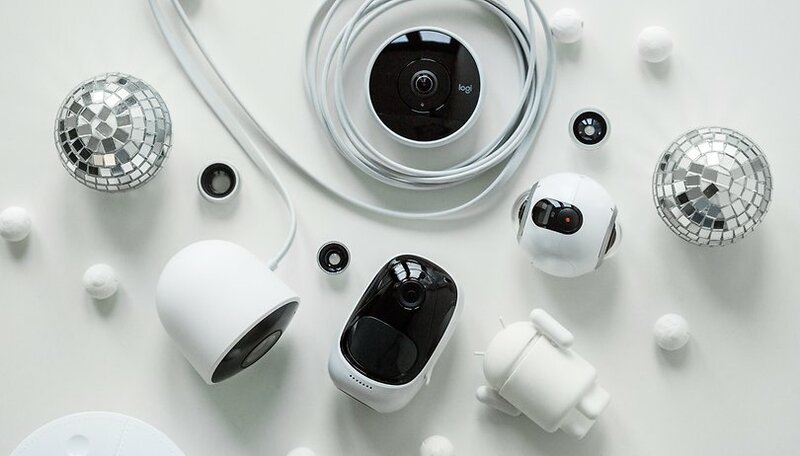 Indoor and outdoor cameras, with or without support for microSD or cloud services, which can be operated with voice commands, are examples of some of the features that you should pay attention to when deciding which is the right device for you. So, what do you want to do with your smart cam? First of all, why did you decide to buy a smart camera? This may seem like a simple question, but it is an important one. Do you need a camera inside or outside? Do you want to monitor your children while you are in another room, or do you simply want to have peace of mind while you are not at home? Why is the brand important? Due to the simple fact that some manufacturers such as Nest, Reolink and Logitech, have been working in this sector for a long time and are producing quality, and above all, safe products. This means that you can rest assured about the release of software updates and the security of your data. It is better to do a few checks before jumping in on an unknown brand with an attractive price. The release of updates, in addition to making the device safer, also allows you to introduce new features over time, keeping your device “young”. Security is also an aspect to be taken into account. That's why large companies like Nest have easily spread their smart doorbells. Nest Hello is an intelligent video door phone that will allow you to know who's ringing the doorbell at all times without having to peek. The main purpose of a smart cam is to monitor a room and notify you in the event of an intrusion. These are the basic functions but as specified above, each brand and every single device offers different functionalities. Some surveillance cameras are able to autonomously rotate when the sensors perceive an unexpected movement or noise. Others can only be rotated manually, which could be a problem in a large, uneven room. Also check for infrared sensors for night vision. One aspect to consider is undoubtedly the quality of the videos: for some users it is essential to have videos in high resolution, while for others even simple clips or photos are sufficient, so remember to check the functions and specifications. Many smart cams offer a resolution of 720p, and some can have a resolution of 1080p. Check if the camera allows you to save video footage on a microSD card or in the cloud. In some cases, the brand offers the possibility to pay a monthly subscription to access the complete history, and instant notifications with lots of photos or short clips, for example. Check if you need a subscription to fully use the smart cam you are considering and, if so, decide if you are willing to open your wallet for this additional expense. Voice commands in smart cams, compared to other smart home devices, are not yet so common, but even security devices are entering the world of Alexa, Assistant and Siri. The interaction with security cameras via voice commands is certainly different from what we have seen for example with lights. Moreover, we should limit the use of voice commands to certain users and functions to avoid compromising the functionality related to the security of the camera itself. Most cameras come with a power supply. This means that you will not always be able to move it easily to a different location, forcing you to always choose a location close to a socket (or keep an extension cord handy). However, an increasing number of smart cams can also work without a power supply. The Netgear Arlo, for example, can run only on battery power. Some even have rechargeable batteries inside and this certainly gives you more control over where you can install the camera. Most smart cams apps are available for Android and iOS, but in some cases you can access the desktop website to review videos, for example. One aspect not to be overlooked is the interface of the app, as this is the window to access the camera. Make sure that the app has everything you need in the main functions such as, the activation of the microphone, night vision, notifications via email / smartphone, access to video in real time, the possibility to stop a possible sound alarm, facial recognition, and more. Integration with other devices is important. Via a hub or the IFTTT channel, devices of different brands can communicate with each other. How much do you want to spend on your smart cam? Budget matters, but on average, the smart surveillance cameras cost an average of 200 dollars. There are obviously more expensive or cheaper solutions, such as the Reolink we tested, depending on the features offered and the materials used for the assembly. Which smart cam is the best? Before providing you with a list of what we believe are the best intelligent surveillance cameras, we will take some time to test others and provide you with a more comprehensive and detailed overview. If you have already done your research, you will have noticed that Nest is probably the dominant one on the market. Working hand in hand with Google, you can rest assured that your device will be up-to-date with the latest software, as well as being high quality. With a Nest camera, you know that you are getting a reliable product. Before buying a security camera, think about the use you want to make of it; and keep in mind that the budget options may not always be the best choice. Do you already use a surveillance camera? If so, what kind? I just installed Kuna Toucan and I'm really happy with the result. It plugs into the socket of an outdoor light so no need for new connections or anything. Got it on sale at 100$ (instead of 200$), very good value for money. Canada's CBC "Marketplace" program recently did something of a shocker on home security cameras and other IoT smarthome services: google "We hired ethical hackers to hack a family's smart home — here's how it turned out". There actually is a website that publicly streams its hacks into what home "security" cameras - indoors or outdoors - are seeing, 24/7. There are some tips in the program for checking OEM privacy management and setting up secure access and two-factor authentication for use of these tools. I've used a few cheap Chinese security cams, and yes it can be a mission to get it set up but generally I've been happy with the quality and UI. I had a great one, which came with a app full of features - I wanted it to record my garden area through the window. It was great as it worked perfectly in the dark, switching to night mode with zero glare. Unfortunately they issued a update which made it unstable outside of China. My point is this cost me £30 and it would match the quality of one priced £130+ - so basically if you are paying more than £50/60 you are being ripped off and paying the brand. Affordable (battery powered) Motion Detectors that set off a LOUD audible alarm (if a door / window is opened) can be obtained at any Hardware Store (easy to turn ON / OFF). And finally? If you're still dumb enough to Trespass / Break-in? I can get my 9MM Baretta (magnetic safe built into bed frame - free with bed mattress purchase), take aim and calmly empty my clip of hollow points into you (hasn't happened yet, I live in a peaceful community). I disagree, I started out with a $60 Wansview 1080p IP camera and added a couple more mid-range no name brand 1080p cameras to the mix. I also tied them all together using a DVR program called IspyConnect to record motion and save to an external drive. Then I use Google Remote Desktop to view the streams while I'm away from home. It turned into a DIY project but it was fun and easy.